The “Roofing System” is the connection between your home’s Roof along with proper Insulation and Ventilation of your attic space. This partnership is absolutely critical to the energy efficiency and overall comfort of your home. In addition to the comfort level of your indoor living spaces, you might be wasting a great deal of Energy and Money (utility bills). Proper Attic Ventilation in the winter keeps your attic at a cool temperature. This cool temperature prevents snow from melting on your roof to recollect on the eves of your property in the form of ice dams. Ice dams can cause significant structural and water damage to your roof, including mold on the inside of your attic. During the summer, proper attic ventilation is necessary to remove super-heated air from the attic space. This helps improve energy efficiency and the comfort levels within your home. In addition, proper attic ventilation reduces wear and tear on your roofing system and removes moisture from your home’s interior. Removing Moisture And Ice Dam Prevention. As outdoor temperature drops we add heat and add moisture to our homes. Sometimes the problem of adding moisture is apparent – it takes the form of condensation on our windows. How does this moisture get on our windows? It is carried there by air. But what about those surfaces we can’t see? If there are holes between the house and attic, stack pressure will drive moisture laden air through those holes into the attic. Moisture in the attic is drawn to cold surfaces just as it’s drawn to your windows. When those surfaces get wet, they rot and mold ensues. The theory behind attic ventilation is to give that moisture a place to escape before it causes mold, mildew, rot, or other problems. There is a third reason for attic ventilation, and that is to help keep the attic cool. Studies show ventilation that meets standards reduces peak attic temperatures by around 15 degrees. Remember that stack driven air leakage into the attic in the heating season? In the cooling season stack effect reverses. 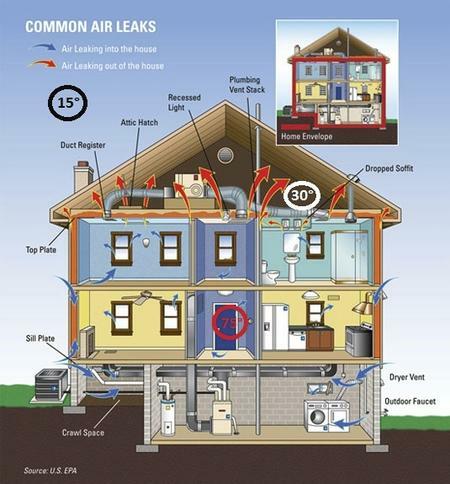 Any leaks between your home and your attic push super-heated attic air down into the house. Attic insulation and ventilation are partners in keeping your home comfortable at a reasonable cost. This pair also work together to maximize the life of your homes roofing. Hot attics reduce the life of underlayment and asphalt shingles, and moisture in cold weather can cause mold and mildew on the underside of your roof decking in your attic. Insulation Between Your Homes Ceiling and Attic Space retards the loss of warm air in the Winter and Cool Air during the Summer. Ideal insulation is evenly distributed throughout the attic and is in contact with the living space ceiling and attic framing with no air gaps that allow air to move under or around the insulation. An insulation rating of R-49 value is typical for Southeast Michigan but most importantly is the item above. An attic that has 8 inches of cellulose but has insulation gaps may lose 50 % of its effectiveness with only a few percent of the attic area “un-insulated”. Insulation type is a factor. Some insulation types just can’t be installed to fill all of the “nooks and crannies” or be in 100% contact with the ceiling (fiber glass batts are the least effective). Ventilation of the Attic Space reduces moisture (that originates from in the home) and heat. The goal is that attic air be at the same temperature and humidity as the outside air. In practice, attic air temperature within 20 degrees of exterior air temp is considered acceptable. Heat rises. Ideal ventilation has air entering at the soffits and exiting at continuous ridge vents whereby intake square footage of vent area equals exit square footage of vent area. One square foot of venting for each 150-square-footage of attic floor area is the normal design criteria. Other strategies include gable vents in conjunction with soffit vents, soffit and roof vents, wind or powered vents, etc. Dead air spots should be avoided: Attic insulation that blocks soffit vents will create areas where there is no air flow. Likewise, roof vents in combination with gable vents will short circuit air flow and create dead air spots. Insulation and ventilation work together. Taken alone, a well-insulated attic that is poorly ventilated will create a very hot dense insulation barrier on the ceiling which will partially dissipate its heat into the home. A well ventilated poorly insulated attic will speed up the transfer of the homes conditioned air into the attic. DTE can be a good source of information on this subject as well. They can provide estimations relative to the pay-back period for the cost of making improvements. DTE can also provide rebate / tax incentives information as well.